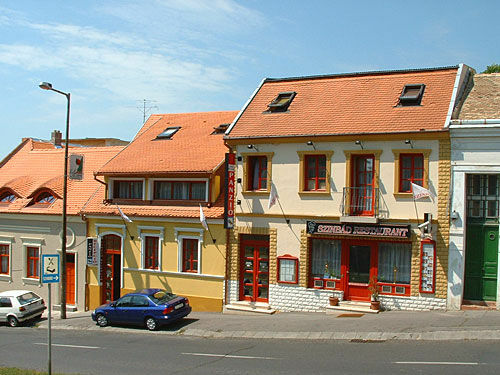 The building is in the historical town centre, close to the downtown predestrian shopping streets and you can approach from the railway station with a direct bus line. 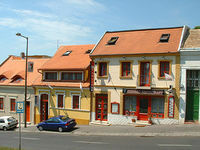 The modern furnished hotel and pension (with central heating) are waiting for their guests throughout the year. The cars have a closed parking possibility. In the Szinbád Restaurant Pension there are 18 rooms: 15 double- + spare bedrooms, bathroom with shower, 1 double-bedroom, bathroom with shower, 2 double- + spare bedrooms, bathroom and shower. In rooms there are central heating, telefon, minibar, SAT TV. There is the 60-seater restaurant, where we provide the board á la carte. We are waiting for our guests in our restaurants with the full-scale selection of ice-cold Amstel beers, with special cocktails and coffee- specialities.